The book gives a representative overview of what has been researched and accomplished in the field of Indian Buddhist Art and Archaeology since Wilkins’s article on Bodh-Gaya in 1788 or Thomas Daniel’s first illustration on the Kanheri caves in 1798. The bibliography includes 4081 entries, covering published materials in English and French languages over the last two centuries. It is divided into two parts. 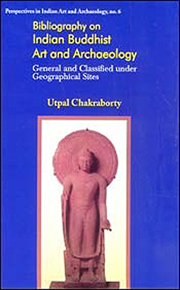 The first part contains 2410 entries and archaeology and Indian art in general, history, religion, some Buddhist sites outside present India - with special attention given to Pakistan, etc. Entries in the second part are exclusively devoted to Indian Buddhist sites. There are 57 sites; each one is individually studied. Utpal Chakraborty (born 1951) graduated in Fine Arts from the Vishva Bharati University (Santiniketan, West Bengal, India) in 1972 after which he received ‘National Cultural Scholarship’ from the Government of India and ‘Cultural Scholarship’ from Government of France. He obtained a Master and a Doctorate degree from the Universit‚ de Paris III, Sorbonne Nouvelle (Paris) on Indian Buddhist Art and Archaeology under the guidance of late Professor Jean Boisselier. Currently he is working on two projects on Indian Buddhist Caves. Mr. Chakraborty is also a painter and is living in Paris since 1976.